In March 2010, International Physicians for the Prevention of Nuclear War published a major new briefing paper on the global climate and health effects of nuclear war. 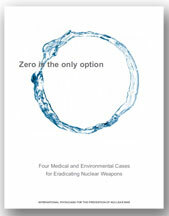 Zero is the only option, produced for the 2010 Non-Proliferation Treaty Review Conference, draws extensively from the work of climate scientists at Rutgers University and the University of Colorado at Boulder, including Alan Robock, O. B. Toon, Michael Mills, and their colleagues, who have documented the climate effects of regional nuclear war. Each page of this blog reproduces a case study from the briefing paper, and provides a collection of resources for further study and for use in presenting this information to others. The complete paper, with footnotes and references, can be downloaded here. Publication of the briefing paper was made possible thanks to a generous financial contribution from IPPNW’s Swedish affiliate, Svenska Läkare mot Kärnvapen (Swedish Physicians Against Nuclear Weapons). News and events about "Zero Is the Only Option"